Contains nutrients aimed at boosting the body's production and synthesis of endorphins and serotonin. 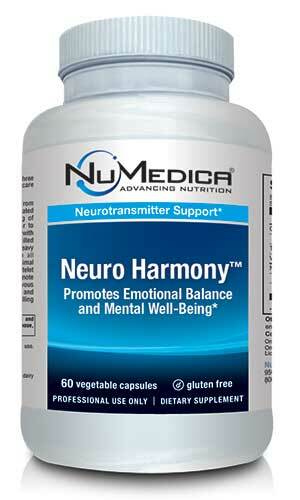 NuMedica's Neuro Harmony-60c is designed to support the nervous system while advancing emotional health and well-being. NuMedica combines powerful nutrients that take aim at the neurotransmitters, which are at the heart of a healthy nervous system. In addition to vitamins B-6 and B-12, NuMedica's Neuro Harmony-60c delivers 5-HTP and pyridoxal-5, this is well known for its role in the synthesis of serotonin. A healthy emotional outlook is dependant on the proper functioning of neurotransmitters, and 5-HTP is thought to be an enhancer of endorphin levels. As such, they are a key indicator towards a person's emotional and mental well-being. NuMedica's Neuro Harmony-60c comes in capsule form and it helpful in maintaining a happy and healthy outlook on life. Supporting emotional balance and propping up mental well being is at the heart of what Neuro Harmony-60c does for the body and mind. Neuro Harmony delivers the vitamins B-6 and B-12, magnesium, and 5-HTP and pyridoxal-5 that aid in the production and synthesis of endorphins and serotonin. Maintaining a happy and healthy mental outlook on life is not always easy as is well known to any one who is trying to get through life. That being said however, Neuro Harmony-60c provides tangible support in the body's efforts to maintain emotional balance and mental health. Tapping into the science of how the brain works, Neuro Harmony-60c targets the neurotransmitters that are responsible for delivering the boost of endorphins that stimulate the serotonin that provides for emotional balance and mental well-being. 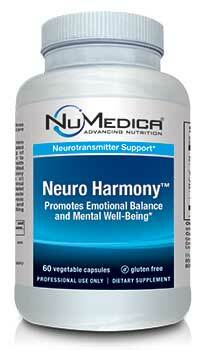 The main benefit of Neuro Harmony is the peace of mind that emotional stability provides. Other Ingredients: HPMC (vegetable capsule), silica, maltodextrin, magnesium stearate. Is it ok to take a higher dose?